Another of the Tri-City's lesser known districts, but nonetheless legendary in its own right, is Gdynia Orlowo. This town has a number of charming hideouts as well as established hotspots. If you're looking for a casual stroll along the sand or a night of theatrical excitement, then Orlowo could prove the perfect place for you! According to ancient legend, two magnificent eagles fought above Orlowo's cliff and in memory of this great aerial battle, local people called their village Orlowo, from the Polish word for eagle. When you arrive here, the first thing to do is check out that historic cliff, which is called the Redlowo cliff. Oddly enough, this sheer landmark is made only of sand and yet the sand just doesn't crumble. Who knows what those eagles did to it, but their work has lasted to this day in spectacular form. 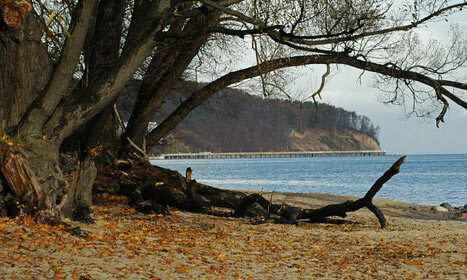 Nearby is the Orlowo pier, which extends a good distance into the Baltic. Everyone you encounter on the pier will be eating ice cream or holding hands with a loved one, so make sure you procure at least one of these two precious commodities before walking out onto the wood! You can also find some impressive theatres here, if the muse inspires you. In the summer, the Gdynia Municipal Theatre sets up shop on the beach, where the small and shallow waves provide the perfect backdrop for plays both classic and modern. Open the whole year, the Municipal Theatre has become a cultural landmark in Orlowo, hosting plays and workshops, as well as large-scale celebrations and other cultural events. Bring your monocle and top hat, as well as some popcorn and you'll be set for the weekend! Orlowo also offers some commercial treats and you'll find no shortage of restaurants and places to party. The Taj Mahal has some tasty dishes and the ice cream in the cafes here can't be beat. Or, if you're looking to spend the night at home, make sure you check out the fish market for the freshest catch for a delicious, home-cooked dinner. Meanwhile, the outdoorsy type of traveller can spend the afternoon horseback riding in the quiet woods or on the soft, sandy beaches. Orlowo is a place full of possibilities, so once you've gotten your fill of the typical sightseeing regiment, head on over to the lovely Orlowo for some culture, adventure, or simple relaxation!